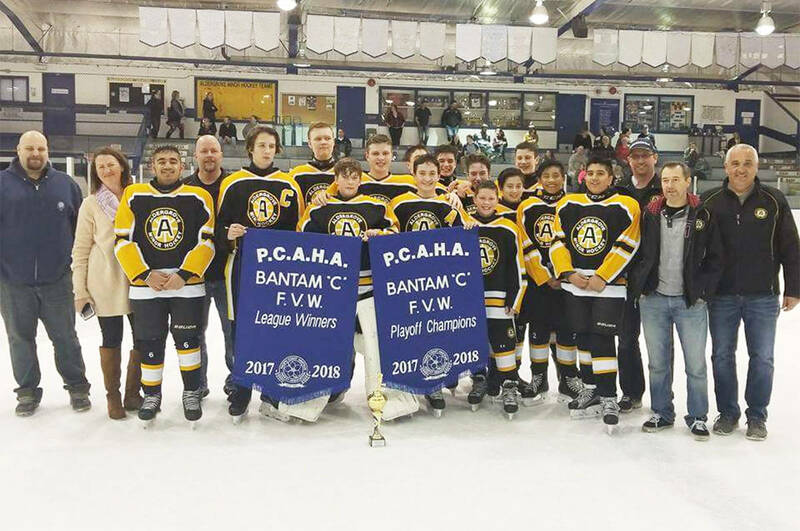 It was an amazing end to a great season as the Aldergrove Bantam C2 Blazers played the last ever ice hockey game in the old Aldergrove arena, Friday, March 16 versus Aldergrove C1. Both teams played their hearts out but Blazers’ Kole Wheeler scored the game winner with nine seconds to go in the third period. This season the Blazers enjoyed one tournament Gold Medal win, League Winners Banner and Playoff Champions Banner — a special season. Head coach Brad Wheeler and assistant coaches Phil Konkin, Rob McElhinney and Rob Lochovsky thank the team for their work ethic. The team consists of Amrit Sidhu, Brendan McElhinney, Cameron Walsh, Izaiah Muth, assistant captain Kole Wheeler, Logan Hamilton, Manmeek Sidhu, Matthew Lacey, assistant captain Mitchell Ohlmann, Nathan Van Santen, captain Nolan Silver, Ryan Lochovsky, assistant captain Zach Konkin and Zereno Pierini. The 45 year old Aldergrove Arena will remain open for the dry floor ball hockey season this summer before being decommissioned and demolished in the fall, when the new ice arena opens for its first season at the Aldergrove Credit Union Community Centre.